"At the time, it was one of the worst things that could have happened." 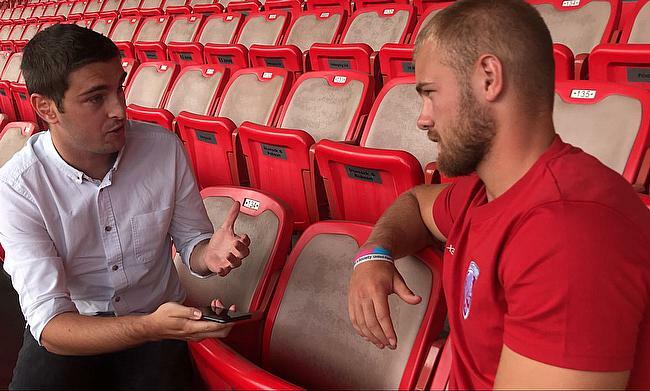 Gloucester’s Tom Hudson speaks exclusively to TRU’s Chris Heal about his remarkable journey from his school playing fields to appearing on the Premiership stage. Before recently, it had been seven years since I last spoke to Tom Hudson and at that moment in his life, everything seemed rosy. The lightening quick back was just 16 years-old and was arguably, along with Sale Sharks’ Sam James, the standout player in Wilmslow High School’s 1st XV side. At that point, Hudson was lining-up alongside players who were two school years ahead of him, but he wasn’t phased in the slightest. Hudson was integral in helping guide Wilmslow to the then Daily Mail Cup semi-finals, but a certain Elliot Daly stopped the Cheshire outfit from reaching Twickenham back in 2011. The Astonishing Story Of How Master Chai Revived Tom Hudson’s Professional Career. We had an interview with Tom himself who told his great comeback story ?? Must read! After completing his GCSE’s, Hudson’s remarkable journey in rugby began. He may have thought he was living the dream having signed an academy contract for Leicester Tigers, but it quickly turned into a nightmare. For around two-and-a-half years, Hudson suffered groin and abductor problems. The injuries began in the pre-season of 2012 in a game against Cardiff Blues and they continued to hamper Hudson’s progress. He saw more than 10 specialists to try and solve the issue, but at just 19 years-old, he made the decision to retire. Hudson then joined Leicester’s community programme and was sent out to Malaysia to help coach Kuala Lumper Tigers. During his time in Asia, Hudson was offered solutions to his persisting injury problems, but after failing to find a cure, Malaysian doctor Master Chia was recommended to him. After so many doctors and surgeons could not fix his injury, Master Chia was able to use non-invasive electromagnetic acupuncture and that kickstarted Hudson’s recovery. “It has been a bit of a rocky road!” says Hudson with a small smile on his face. “I went to Leicester from Wilmslow and of course, I had to give it up for a few years due to the injury. Hudson is now looking forward to the future with Gloucester and it was the Cherry and Whites who gave him a route back into the game. "It's a great sports story"
Last year on his Premiership debut, Hudson showed exactly what he can offer Gloucester going into this term. He scored the winning try against Saracens under the lights at Kingsholm which is a moment he will never forget. “It was huge for me,” Hudson adds. “Just running out and the whole occasion couldn’t have gone any better. We don’t talk about it too much, but my first actual senior debut was Pau away in the European Cup and that couldn’t have gone any worse! As Hudson eludes to, Gloucester did have a solid campaign last year. In Johan Ackermann’s maiden term in charge of the club, they mounted a serious challenge for a top four spot and also reached the European Challenge Cup final. At the end of last season, Hudson signed a contract extension with Gloucester and he began this campaign by starting at full-back in their 27-19 pre-season win over Ulster. He now excited by the challenge of working hard and writing the next chapter of his remarkable rugby story. “It is my first full pre-season under a senior cap and it is great to learn off some of the new lads and equally, kicking on from last year so at the moment, I am spot on. “You will the boys say a lot that we are ‘team first’ orientated and I believe in that. I will do whatever I am asked to do. Whether that means train hard, sit on the bench and be the 24th man or start, there is a bigger picture at this club. “We have signed some good boys this year and we are a fairly new squad with big ambitions so I will be the cog in whatever machine it needs to be."